Wow, where to being with Terra Formars… there so much buzz about this anime when it was airing since the manga was so popular. So I caught clips of the first episode and I immediately dropped it because the heavy censorship annoyed me; there was nothing but black boxes covering every intense scene. I decided to wait until the season was done so that the uncensored version of Terra Formars was released and from there I picked up the series from beginning. The anime left a bitter taste in my mouth, as with most people. That bitterness left in my mouth can be attributed to the rise and fall of Terra Formars rooting from the horrendous story telling with an anime - which had so much potential with it’s premise. A small amount of individuals on Earth has been inflicted with a virus only found on Mars and there aren’t enough samples of the virus to use for study to harvest a vaccine. So the story of Terra Formars is about a group of surgically enhanced humans who travel to Mars to bring back samples of the virus back to Earth. The only problem is that 500 years ago herds of cockroaches have been sent to Mars and within those 500 years the cockroaches have somehow evolved into these human-like super bugs. So the uphill stride to obtain samples of this Mars-unique virus has a layer of complexity since there are these powerful mutated cockroaches are set to hunt down any intruders who come to Mars. As I said the main issue with the Terra Formars anime is it’s terrible story telling. With most anime that have thick storylines, the backstories are usually presented in the beginning of the anime. However it's not the case with Terra Formars; the backstory is not presented in the beginning, instead it’s distributed throughout the anime with flashbacks. Personally, this created a lot of confusion for me during the anime because there were so many questions that I wanted/ most people want answers to that could not be answered since the backstory was not presented in a proper manner. Not to mention, it’s a pretty boring to watch an anime where you get excited to see the fights but then turn to a 10 minute flashback scene and then revert back to see 1 minute of action, and then revert to another flashback. On top of that the final few episodes piled on huge amounts of cliffhangers that sort of leave people disappointed since it just adds more fuel to the fire to the fact that more unanswered questions get introduced if you purely watch the anime. And if this anime does not get a second season to finalize things, the whole first season/ anime is really pointless. In terms of characters, this portion of the anime sort of bothered me as well. There's not really a standout out of the bunch. We're introduced to characters that seem to be important and vital to Terra Formars but surprisingly, this is what really bothered me, once a handful of these "vital characters" are introduced, they're killed off the next moment. It's like uhhh... really? And on top of that, after they die... a flashback scene pops up...! It should be flashback, then you're killed off... seems like the right approach in storytelling if you ask me. As for the animation, if felt like LINDEN FILMS could have done a much better job at turning up the brightness/ contrast in 90% of the scenes animated. I mean the colouring was so dark; unless I turned up my brightness of my screen to max and have my eyed blinded, it was slightly difficult seeing the details in a few of the scenes of the anime. Like bruh.... I don't want to max my brightness and wear sunglasses just to see the animation properly. Anyways, on a lighter note I guess one of the positives from Terra Formars is it's music. The OST was actually pretty epic - that's all I have for positives haha. Overall, now looking back at the anime, I really enjoyed the first three episodes; I thought they were a great mix of horror and action. But by the time I got to episode 5, I pretty much got the gist of how things were going to end up - mindless fighting until the end! If you enjoy mindless fighting I guess I'd suggest Terra Formars, but if you're looking for a space/horror anime that has proper storytelling and a phenomenal backdrop, you might want to put off Terra Formars. And now that I really look at the anime overall, the first season which was 13 episodes was only 1 or 2 days in real time. Lol.... oh anime, how you never fail to put a smile on my face. 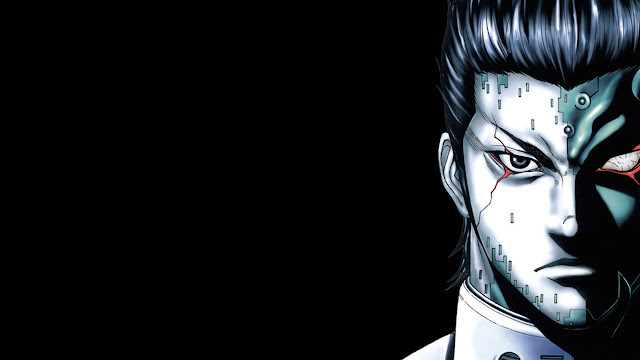 Anyways that's it for this review, if you enjoyed Terra Formars tell me in the comments down below or want to give me feedback on my review, I'd love that as well!